Over 60 people attended the LEA Annual Members’ Meeting and Legislative Awards Banquet, which was held February 21 at The Mermaid Event Center in Mounds View. 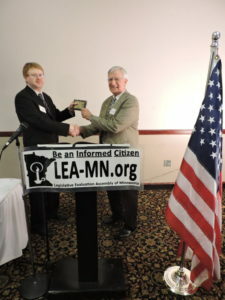 LEA Board Chairman/President John Augustine spoke of the problems caused when our Minnesota Constitution’s single-subject rule is ignored, and of the threat that earlier election dates pose to all citizen groups evaluating public officials’ performance and educating fellow citizens about that performance. The annual LEA Legislative Awards Banquet will be held Tuesday, February 21, 2017 in the Coral Room, at the Mermaid Event Center 2200 County Hwy. 10, Mounds View (near Ramsey Co. Rd. H, just northwest of junction of Hwy. 10 and I-35W). Free parking and entrance are on the west side, in back of the building. 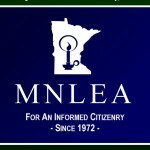 Note from Mr. Augustine, Chairman and President of the Legislative Evaluation Assembly of Minnesota: LEA is on record in its 2015 report (available at www.lea-mn.org) as being opposed to felon-voting restoration language very similar to what is in a bill that has been passed by the 2016 Minnesota Senate. However, the views expressed in this piece are the author’s and not necessarily those of the LEA Board or its members.